Eucalyptus forests are a competitive and efficient alternative to convert carbon from the atmosphere in cellulose, an important source for paper manufacture and bioenergy production. To obtain transgenic Eucalyptus with important traits improved it is necessary to make modifications in genes that affect the final phenotype. One interesting gene that follows this requisite was recently found: this is the AtSHN2 gene (Arabidopsis thaliana SHINE 2). AtSHN2 codifies to a Transcription Factor known as “Arabidopsis SHINE/WAX INDUCER”. Instead of inducing drought tolerance in transgenic rice (Oryza sativa), AtSHN2 overexpression causes: i) 34% increase in the cellulose content; ii) 45% reduction in lignin content and iii) increase in wood digestibly (elevated S:G ratio) with no compromise in plant strength and performance . The discovery of AtSHN2 function in plant cell wall formation, led Ambavaram and collaborators  to perform other studies and ultimately to propose the following model: AtSHN2 regulates positively MYB transcription factors (TF) related to cellulose synthesis and it down-regulates MYB TF’s related to lignin formation. At the same time, SHINE can repress NAC TFthat controls MYB expression. As a consequence of the interesting phenotype achieved through AtSHN2 overexpression in rice, this work focused on the identification and analyses of AtSHN orthologues in Eucalyptus. Bioinformatics tools were used to search for AtSHN similar genes in Eucalyptus. Moreover, the expression profile of the corresponding genes in Eucalyptus was evaluated to prove their role as AtSHN. To carry it on, the expression experiments were done with flower, leaf and xylem. If the Eucalyptus putativeSHINE's has the same function of the AtSHN’s,, gene expression in flower tissues will be the highest . This is because it is known that AtSHN’s genes are preferentially expressed in abscission and dehiscence zones, a phenomenon that usually occurs in lots of flower tissues. Putative transcription factors of the SHINE family were searched in Eucalyptus by comparing the AtSHN amino acid sequences with the Eucalyptus genome assembly (obtained from Eucalyptus grandis – http://eucalyptusdb.bi.up.ac.za). This analysis revealed the existence of two sequences with high similarity to AtSHN proteins. Quantitative RT-PCR assays were carried out to verify the expression profile of these genes in different tissues (leaves, flowers and xylem) of the hybrid variety E. urograndis (E. uroplhyla x E. grandis). The RNA extraction was carried out following the protocol described by Zeng & Yang (2002) . The qRT-PCR was performed with the SYBR® Green PCR Master Mixkit from Applied Biosystems. The Results were analyzed according to the mathematical method described by Pfaffl, 2001 . Plant materials were provided by the International Paper Company, Brazil. The comparison of the AtSHN amino acids sequence with E. grandis genome revealed the existence of two putative SHN genes in Eucalyptus (named EgSHN1a and EgSHN1b). A phylogenetic analysis showed that these Eucalyptus SHN genes are orthologs to the AtSHN1 ofArabidopsis thaliana (Figure 1). Phylogenetic analysis of SHN genes from A. thaliana (AtSHN1, AtSHN2 and AtSHN3) and the new SHN genes identified in Eucalyptus grandis (EgSHN1a and EgSHN1b). The scale bar of 0,1 corresponds to 10% sequence divergence. Bootstrap values are given for nodes and are considered as value of significance of the branches. The proteins encoded by EgSHN1a and EgSHN1b share approximately 58% identity to AtSHN1and a conserved gene structure is found between AtSHN and both EgSHN genes: a single intron is present and located approximately 80 bp from the start codon. In addition, as in AtSHN1, EgSHN genes contain an AP2 DNA binding domain, which is in accordance to their putative role as transcription factors. More importantly, the domains “mm” and “cm”, which are exclusive of SHN genes, could be identified in the Eucalyptus sequences. In the same way that the gene sequence is very correlated between the species, it’s probable that their function are the same two. 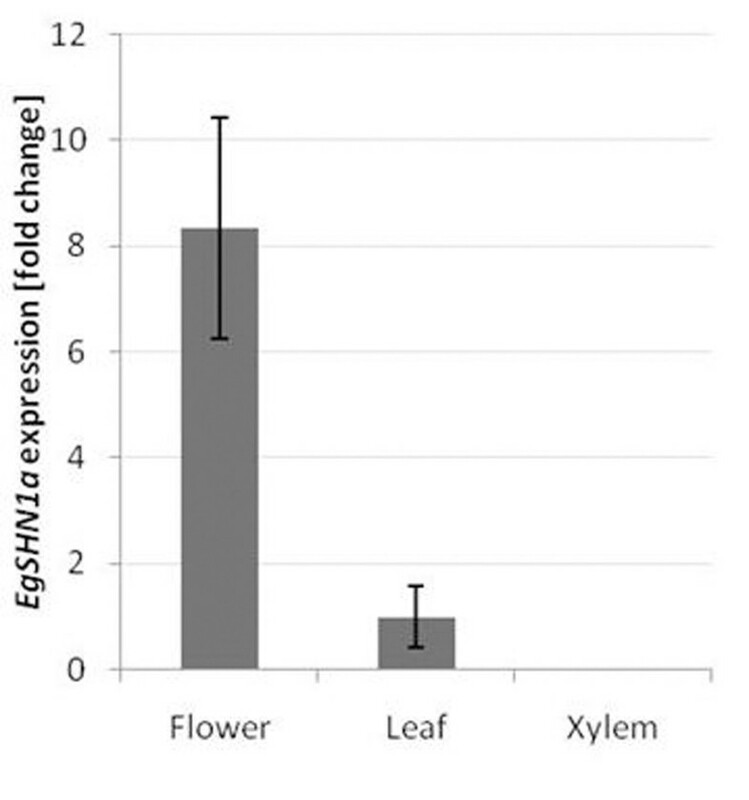 Gene expression analysis revealed a higher expression of EgSHN1a in flowers (Figure 2). This result is similar to the AtSHN1 expression profile , suggesting a similar function for EgSHN1a. EgSHN1a expression ratio in three different tissues: flower (rich in abscission and dehiscence zones), leaf and xylem assessed trough qRT=PCR. Data are expressed as fold change and leaf was chosen as reference condition. Error bars representSE(n=3). The expression pattern of the gene EgSHN1b is being carried on. The EgSHN1a function might be the same of AtSHN1 as suggested by their similar expression patterns. It is possible that, in Eucalyptus, biosynthesis of cuticle and cell wall in abscission and dehiscence zones is regulated by EgSHN’s, as already described in A. thaliana. The new genes described here are interesting candidate for the development of transgenic Eucalyptus. Overexpression of SHN genes in A. thaliana increased tolerance to drought and pathogen attacks and greatly improved cell wall quality.